Wheel Alignment & Tire Mounting Services in Longwood, FL - EURO Specialists, Inc. When it comes to your tires, driving on a bumpy road that has been poorly maintained, hitting a curb or driving over a pothole, causes your wheels to come out of alignment which can cause serious problems down the road (pun intended). Why is misalignment an issue? Basically, when your tires come out of their ideal place, they will begin to wear out much quicker, shortening a tire's life by thousands of miles. If you allow your tires to continue to run without an alignment, you run the risk of steering issues and ruining suspension parts. When your tires are placed properly, your car will run smoothly, causing less power to be needed which results in less fuel usage. Tires are expensive to replace and repair, so routine checkups are highly recommended to occur (every 6 months). 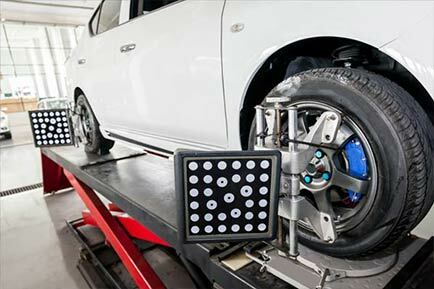 How Do I Know If I Need a Wheel Alignment? Uneven tire wear is another common indicator. Often the inside will be more worn than the outside rim. Squealing tires can mean several things, but it can also signify alignment and balance issues. Rapid Tire Wear: every tire manufacturer has estimated tire life expectancy under normal conditions. Make sure to know how long yours are meant to last and compare that to the actual length of time between tire replacement. Once it has been confirmed that you do in fact have a tire balance issue, tire mounting will be necessary to bring them back into their proper place and balance. Tire mounting is exactly as it sounds, the physical act of placing tires on your vehicle. eCal&trade; Auto Calibration with a Touchscreen interface. The Road Force Touch&trade; wheel balancer features SmartWeight&reg; balancing technology and a patented BullsEye&trade; centering system so you can trust that wheels are balanced correctly every time. CLICK HERE to visit our appointment request form where you can select your desired date and time for your wheel alignment and tire mounting service needs. We look forward to helping you stay safe and happy on the road.